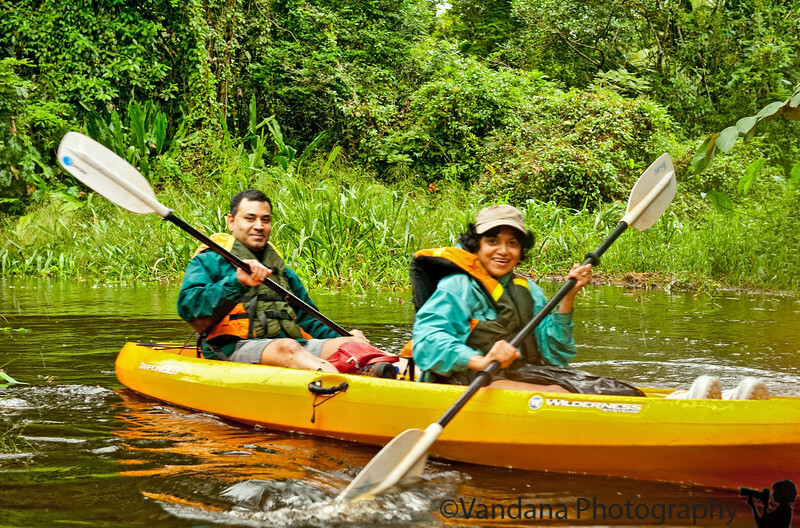 December 15, 2010 - V and K go kayaking in Tortuguero National Park. The highlight of the trip was a 4 hour kayak through TNP. We kayaked through narrow canals surrounded by a lush canopy of green forest, and occasionally we would dodge low hanging branches. Sometimes the surrounding overgrowth was so thick it felt like kayaking through a cave. The current was strong and against us on the forward portion, so we ended up bumping into the trees & bushes a bunch of times. Mauricio, our guide on the other kayak, took this picture. We spotted turtles, caimans, kingfishers, spider monkeys, and a mating heron pair ! I think we were a good kayak team and got into the rowing rhythm pretty soon. After the trip, we were so hungry we polished our dinner plate clean. Our last day in TNP. Tomorrow Arenal. Sounds like a great trip! I am so glad you came away with this shot to remember it with. Excellent work, very well done!! You look like you are having a lot of fun! Fantastic capture of this wonderful experience! nice capture! sounds like an awesome time!